An eggcase with the contents of the large yolked egg present . The "Mermaids Purse" of the Smallspotted Catshark - "Scyliorhinus Canicula" , commonly called a dogfish , but actually a Catshark - as true Dogfish give birth to live young. 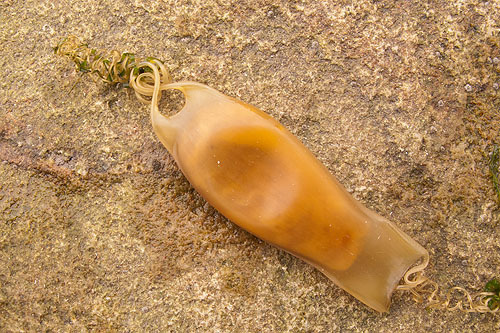 The eggcases of the Smallspotted Catshark (4cm.) and Nursehound (9cm.) are similar but differ significantly in size.